New York City It’s never over until it’s over, but for at least one meeting, the bully-boy owners and the National Football League have been forced to back away from their threats and ignore the even bigger bullying and Twitter threats of President Trump as well. Reports from the NFL owners’ meeting in New York indicate that almost a dozen owners were present at the meeting physically along with the NFL Players’ Association chief and about a dozen players. There was supposedly a dialogue on the issues of racial discrimination. Supposedly, there will be some initiatives taken by the league to support efforts at alleviation racial discrimination. Among the players were some who had been part of protests. Importantly, despite earlier statements by some owners, like Jerry Jones of the Dallas Cowboys, there was no discussion of any rule changes for the anthem. In fact there were commitments that there would be no fines, penalties, or discipline for any players continuing to protest throughout the season. Before the meeting former San Francisco 49ers quarterback, Colin Kapernick, whose initial actions last year triggered these on-going protests over racial discrimination and police brutality, filed a grievance accusing all of the owners and teams throughout the league of “collusion” in their continuing refusal to hire him despite his record last season. The grievance goes to an arbitrator and, if successful, could trigger triple damages. Since his salary was $15 million, if awarded back pay because of the league’s blackballing, he could collect up to $45 million. All of this seems to be pretty much a hands-down victory for the players, their union, and our own union, Local 100 United Labor Unions, who filed a charge with the NLRB Region 16 in Fort Worth over the disciplinary threats of Dallas Cowboys owner Jones. Not to be a wet blanket in the celebration, but this is likely to be a celebration for a battle won, rather than the end of the war. The owners had been caught red-handed in violation of labor law, as pointed out by Local 100, but also according to other noted academic observers in violation of basic free speech protections of the First Amendment of the Constitution as well as the Civil Rights Act. They were also going to be in violation of their own labor agreement with the NFLPA which blocks unilateral changes or in fact any rule changes once training camp ends and the season begins. The owners and the league though are still worried about the continued harassment from President Trump, though the 49ers owner publicly indicated that they just had to ignore all of that. The impact of fan reaction potentially accelerating the recent attendance decline and television ratings slide is likely something that will command their attention more than the President since it hits their pocket books directly. Is this now a “charm offensive,” as the owners try to win back their own players first and try for a wink-and-nod at stepping up against racial injustice in hoping to exchange the public protests seen by the fans for private discussion and concessions brokered by the union? Given that they seem to be willing to invite Kapernick to future meetings, and he seems open to attending, I would almost bet on it. 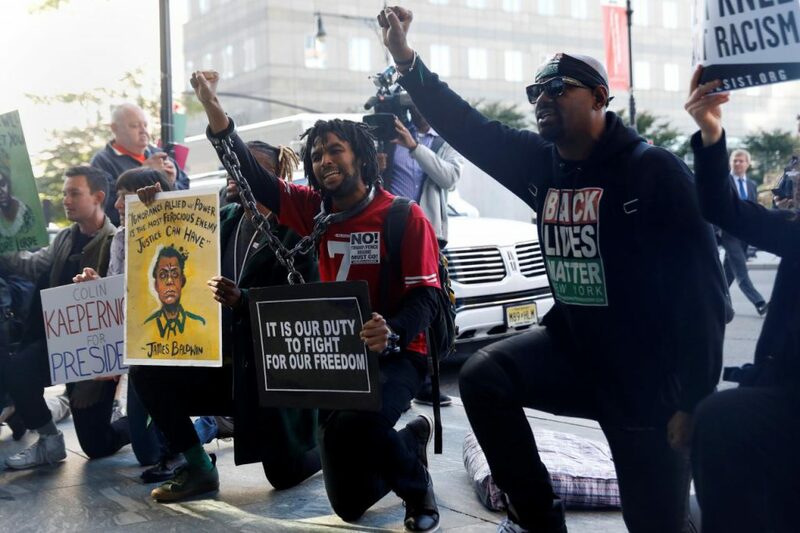 Some measure of the current victory though is a report that Jerry Jones when confronted by Black Lives Matter protests in the lobby of the New York meeting hotel, listened, and kept his mouth shut. For Local 100’s part, that is a huge victory in itself and, depending on how the weekend games play out, could be sufficient for us to withdraw out charge at the labor board for now.